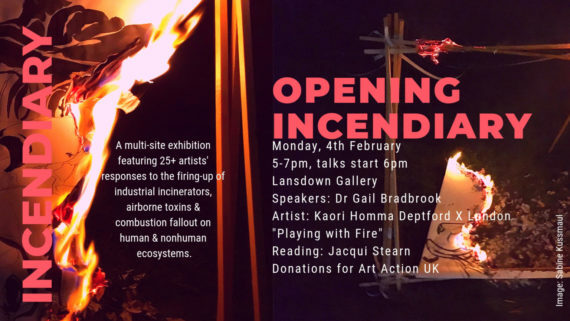 Incendiary is a multi-site exhibition involving more than 25 artists responding to the fire of industrial incinerators & combustion fallout on human & more than human ecosystems. and the curator, Patricia Brien. It was a discussion around the persistence of industrial incinerators despite much public protest and debate. Beyond the inferno-incinerator complex however, are the quotidian combustion engines – cars, buses, trucks, seacraft, aircraft – that expel airborne particulate matter via our roads, waterways, and skyways. Ecofeminist Donna Haraway suggests, it is important that humans ‘stay with the troubles’ and really, the environmental hazardslingering and merging with human and non-human ecosystemsguarantees that. This toxic persistence is particularly keen in the case of nuclear combustion sources. The inferno-incinerator conjures the destructive power of elemental fire & borrows from a powerful fire / regenerationbinary association found in various mythologies. However, the fire / regeneration narrative urgently requires metamorphosis as things heat up. Images of Dante’s burning Inferno spring to mind as hyper consumption and subsequent waste fuels the fire and transforms it into toxic matter. Patricia Brien is a UK-based curator and academic. She is currently researching towards her PhD in the Environmental Humanities and Textiles departments at Bath Spa University. She is currently she is the curator of KINdoms at Fringe Arts Bath 2018, lectures at Ravensbourne, London and is working in the practice of textile-based art in relating to the human and more-than-human world. For 15 years she has worked as an academic in Fashion at the Amsterdam Fashion Institute, Royal Melbourne Institute of Technology and more recently as the Academic Manager of Fashion & 3D Design and Interior Design departments at University of South Wales, Cardiff. She has worked in trend forecasting, styling and lifestyle journalism in Paris, Amsterdam, Melbourne and the UK and is widely published in these areas.